Greek food is a common occurrence in my home. My dad is half Greek, so we grew up loving Greek food! My mom has come to be an AMAZING Greek Chef. This is one of our favorite Greek recipes, and I know you will love it, too. The Tzatziki Sauce has such a fresh taste and really adds a great kick to the Gyro. This is how we do it in my home, but it is super flexible. This flat bread recipe is INCREDIBLE! Gently squeeze lemons into a large re-sealable plastic bag, leaving lemon wedges in the bag. Add ingredients & shake. Add chicken & turn to coat. Seal bag & fridge for 2- 4 hrs. turning ocassionally. Remove chicken and grill over medium heat until juices run clear. Mix together and serve over Gyros. Pour the milk into a liquid measure and heat in the microwave until warm to the touch (about 110 degrees F on an instant-read thermometer). If using active dry yeast, mix the sugar and yeast into the milk and let it sit for 4-5 minutes until the mixture is foamy and the yeast has activated. Once the yeast/milk mixture is foamy, pour the mixture into a large bowl or the bowl of a stand mixer and add the salt and 2½ cups of the flour (proceed with the second paragraph of the recipe). If using instant yeast, pour the warm milk into a large bowl or the bowl of an electric stand mixer. Add the sugar, instant yeast, salt and 2½ cups of the flour. Proceed as directed below. Mix well to combine. Continue adding flour gradually in small amounts, until a soft dough is formed that cleans the sides of the bowl. Knead the dough by mixer or hand until it is smooth and elastic, about 3-5 minutes in the mixer or 10 minutes by hand. After the dough has rested, turn it onto a lightly floured surface (I like to use my roul’pat for this) and divide the dough into 12 equal pieces, rounding each into a ball shape. Cover the pieces with a towel and let them rest for 30 minutes. While the dough rests, preheat your oven to 500 degrees F and place a pizza stone on the bottom rack of the oven. Once the dough has rested for 30 minutes, one by one, roll each piece into a circle about 6-8 inches wide, depending on how thin or thick you want your naan. Lay the circle of dough on the hot pizza stone and spritz lightly with water. Close the oven and bake the naan for 2-4 minutes, until it is lightly puffed (some pieces will puff more than others) and brown spots begin to appear on the top. Remove the naan from the baking stone and place on a cooling rack. Brush lightly with melted butter. Stack the hot naan on top of each other as it comes out of the oven. Cover with a towel and let the naan cool completely or serve warm. It must be the day for greek! I woke up thinking I wanted a greek sandwich for dinner today and your the 2nd post I saw this morning with grek sandwiches. I have to make it tonight! Have a wonderful weekend! Yum! I enjoy a good gyro....this looks delicious! This sounds delicious. I do love tzatziki sauce, can't wait to make it! I cant wait to try these. Am on extended vacay and when I get home the family will love a home cooked meal!!! What better one than this! Sounds so yummie. Ty for sharing. I replied earlier but it's gone... maybe because I put a link in it? Anyway, what I said was that I don't know how authentic it is, but my favorite recipe for greek salad dressing can be found on the allrecipes website. Go to the website and search for "absolutely fabulous greek dressing" and it should be the first result listed. It was posted by someone who works in a restaurant so it is a huge recipe, but if you change the number of servings to 10 or 15, it will scale the ingredients to make a standard amount. I love Greek food but I've been intimidated to make it. That sauce sounds yummy and looks easy to make. Will have to give this a whirl soon! I made this and the chicken and cucumber sauce were delicious. I didn't care for the Naan. I found a different recipe that called for an egg which was delicious. Omagoodness the sauce by itself is amazing! I just whipped it up right now in threw it in a pita with some turkey. Made it a million times better. Am looking forward to making it with the chicken. Do you happen to have the nutrition facts or weight watchers points? I made this last night -minus making the bread part-- they were fabulous! Very good naan! I ate mine with avocado feta cheese and olive oil with garlic and herbs. So good! For a long time I've been searching for a bread that was flexible so you can easily put together and easily eat a gyro. Well I finally found a perfect recipe right here. This bread not only folds easily but is delicious. It freezes well and all you need to do is reheat it in the toaster oven. At the end of baking I painted each bread with melted butter and continued baking for 1 minute. I plan on baking a batch of bread and freezing it for future use. Thanks for a great recipe. The milk made the difference! Thanks for relinking to this naan! I am in need of a tried and true recipe for it! Just made this tonight (cheated & bought flat bread)- it was so good! The chicken flavor is great with the tzatziki, red onion & tomatoes. This is definitely a keeper. Thanks! Thanks so much for this recipe! The naan ended up being less pliable, or soft, than I wanted...but I've never made naan before so I'm sure it was user error. This was really excellent, the chicken marinade was amazing! This chicken marinade was AMAZING!!!! However, the sauce was kind of blahhhhh. I added lemon juice, dill and some sour cream to liven it up! I can honestly say I am very excited to try this. I was just doing some Pinterest browsing, and came across this pin, with what is now an idea for tonight's dinner! Thanks! 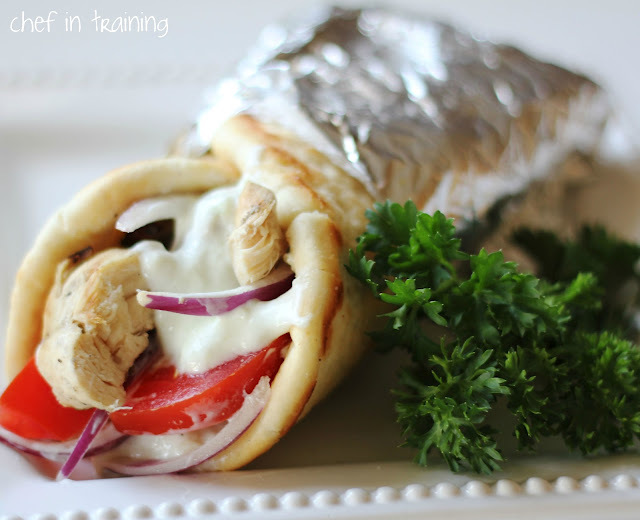 I love the Greek Gyro the bread recipe is great and the chicken has a great taste and my children love them.